Do you want an OOLA life?! I do!! OOLA is a state of awesomeness! It is living a life that is balanced and growing in the 7 key areas of health and well-being. It’s unlocking the potential for greatness that lies within each of us! The 7 F’s of OOLA: Fitness, Finance, Family, Fun, Field (career), Faith, and Friends! 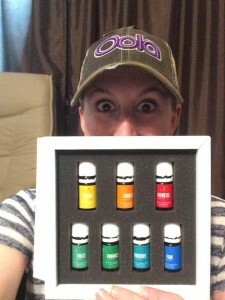 I have the Young Living INFUSED 7 Kit that Gary Young created with essential oils that will help as you persue balance, take action toward your dreams, and pursue your OolaLife! It is never too late to start the your best self! To identify the areas in your life that could use improvement, visit YoungLiving.com/Oola and complete the OolaWheel. Use this OOLA Worksheet to write down your specific goals and actions! Specific blends and regimens for use will be recommended. Then head back here to become a Young Living member and order your OOLA oils! I would love to help you on your journey to achieve your dreams and life your OolaLife! I have reference materials and private FB groups to help you too! If you haven’t already, grab a copy of the OolaGuys’ international best selling book, OOLA: Find Balance in an Unbalanced World. This book, my reference materials, and oily team of helping friends are your perfect companion on your journey to finding your OolaLife. This entry was posted in Going Oily. Bookmark the permalink.